Today I have a bit of a treat for you – CoffeeMuffin’s first guest post! This guest post is from Simone Gribble author of Grrr. Cupcake. (cupcakes for men). As you may know I hate the craze for cupcakes with huge amounts of frosting. Thankfully now Simone has people like me covered with her latest ebook. The cupcake craze has been raging since the 1990s and hit Edinburgh a few years ago with the opening of a few specialist cupcake bakeries in the city centre. I’ve been baking my own cakes ever since I was a little girl and resisted additive and preservative rich store bought cakes. My icing skills weren’t as good though so when these speciality shops opened, professing to sell handmade cupcakes, I thought I should give them a try, for research purposes, you know. I bought two. One was a banana caramel cupcake with two inches of icing and a dried banana chip on top. It sure looked pretty. Imagine my disgust when I bit into the cake only to find that the banana and caramel flavour existed only in the icing – the cupcake itself was pretty bland. The second cupcake, whose flavours I don’t even remember, fared no better. So I took myself back to my own kitchen, inspired to create cupcake recipes where the flavour was in the cake, not the icing. Like Grrrapefruit and Orange, Lime and Coconut and Chilli Chocolate. Kind of an antidote to the cupcake craze. And so, Grrr. Cupcake. was born. Grrr. Cupcake is about cupcakes with grunt, with enough flavour to make your tastebuds tingle and no sugary icing to make your teeth ache. This recipe is the favourite of my friend, Barry, not least because he’s really into proper Scottish Ales. Heat the oven to 180 Celsius. Get your cupcake pan ready. Get a mixing bowl and put these things in it, whisking or forking with each addition to keep the ingredients airy: self raising flour, salt, ground ginger, fresh ginger, cinnamon, cloves and brown sugar. In a microwave safe dish or small saucepan, melt the butter. Add the lime juice and pulp, golden syrup, ale and egg. Mix the wet stuff with the dry stuff, beating until you have a smooth batter. Spoon into your cupcake cases. Bake for about 15 minutes, until cooked. Let them cool on a cake rack. 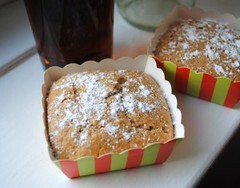 Sprinkle them with icing sugar if you want and enjoy with a glass of the leftover ale. Simone Gribble is the author of Grrr. Cupcake. (cupcakes for men), available on Amazon.co.uk and Amazon.com. (It’s suitable for guys and girrrls!) You can also sign up for news and special offers at www.grrrbakery.com or follow on www.facebook.com/grrrbakery.